Raise your hand if you love to cook but hate to do dishes! No need to dirty one pot to cook pasta and then another one to cook the sauce. The MultiPot Pressure Cooker is the one pot solution to your dishes dilemma. 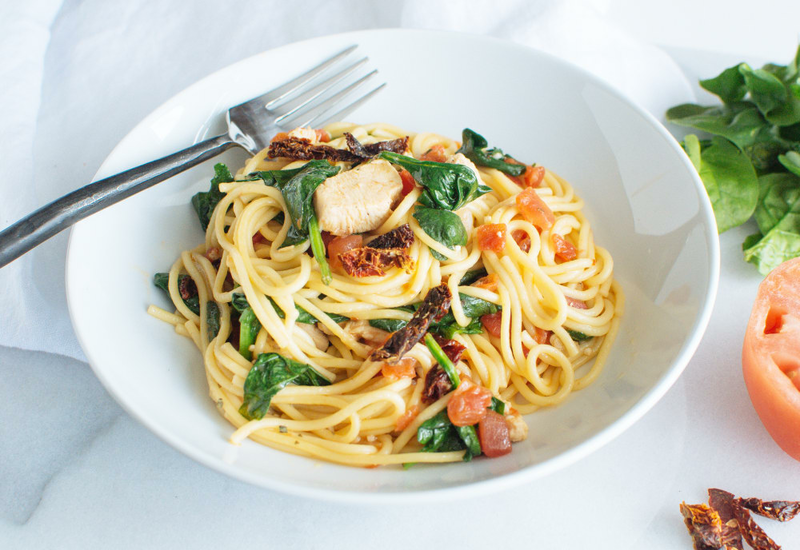 Healthy and delicious chicken spaghetti can be quick, easy (and clean!) when made in a pressure cooker. Sun-dried tomatoes and diced tomatoes help flavor the sauce, while lightly wilted spinach provides delicious greens to your pasta dish. The result is a colorful, family-friendly meal that is ready to serve in 35 minutes. Heat oil in steel pot of a pressure cooker set to Sauté. Cook and stir onion in hot oil until softened, about 2 minutes; add garlic and cook until fragrant, about 30 seconds. Stir chicken with the onion and garlic; cook until no longer pink, about 4 minutes. Stir water, diced tomatoes, sun-dried tomatoes, oregano, Italian seasoning, red chili flakes, and salt with the chicken; add spaghetti and press into the sauce to submerge. Select Pressure Cook (Manual) and cook for 9 minutes on High pressure. Stir spinach into the pasta and sauce, replace lid, and simmer on Keep Warm until spinach is wilted, about 5 minutes. If you don't have any Italian Seasoning in your spice cabinet, combine dried oregano, dried marjoram, dried thyme, dried basil, dried rosemary, and dried sage. Sun-dried tomatoes come in both dry and oil-packed varieties. The oil-packed version in the jar is recommended for this recipe. Per Serving: 253 calories; 11g fat; 26.1g carbohydrates; 15g protein; 26mg cholesterol; 687mg sodium. This dish is exactly the kind of cooking that I like to do, healthy but delicious. I love that this dish throws in spinach with the rest so your family gets a lot of nutrition. I also added bacon to this because.... it's delicious. Highly recommend! Delicious chicken spaghetti! I used whole wheat spaghetti noodles and they cooked perfectly in the pressure cooker. I love that everything cooks together, that makes it so convenient. This recipe also perfect for my meal prep. I added sauce to this and left out the sundries tomatoes. The kids liked it and it’s different than the same old spaghetti and meatballs I usually make for them. Also a good way to sneak in some green without them complaining. I added a cheese sauce and put it in the oven after cooking in the pressure cooker. Super rich and a classic comfort food recipe like my mom used to make when I was a kid. This got rave reviews from my husband and teenage son. It was very tasty and I will be making it again for sure. I cooked it exactly as described except that I used dry sun dried tomatoes instead of jarred ones. They turned out fine. This recipe is a keeper! The flavor were just right and texture of the spaghetti was perfect. But most of all, my husband enjoyed every bite. I do recommend using the sun dried tomatoes. I followed the directions and somehow my spaghetti came out a little under cooked. Anyone else have that problem?